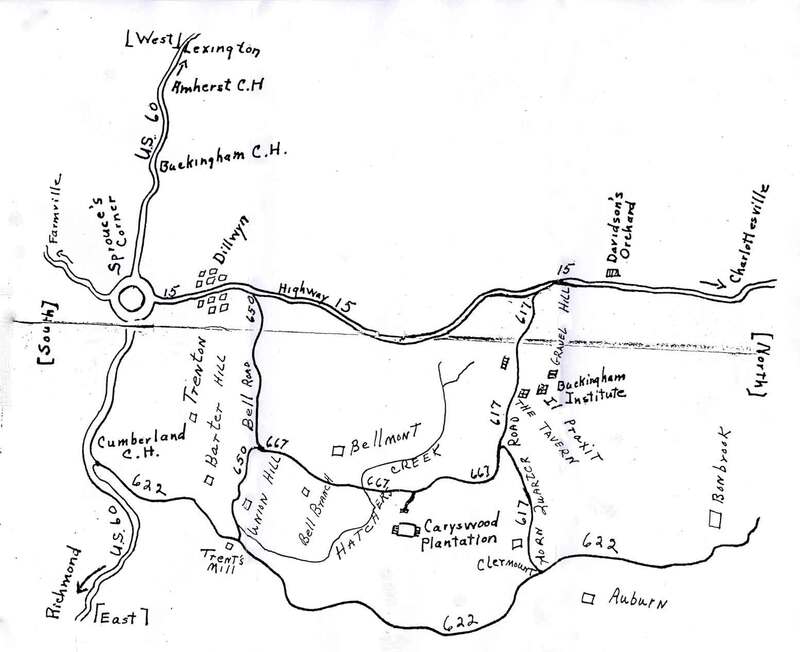 Caryswood Plantation Centennial Map | slate river ramblings . . . . This charming map was enclosed in the invitation to the Caryswood Centennial. Bessie Page Trent (1871–1956), Kate Trent (1900–1987), and Page Trent Bird (1902–1994) hosted the birthday bash on Saturday, August 15, 1953. Henry Cary patented 3942 acres in 1729. He repatented that land with additional acreage totaling 17,000 acres in 1738. This patent straddled the current Buckingham and Cumberland County line probably with more than half in current Cumberland County. Did Sprouse’s Corner have a traffic circle? The map seems to indicate there was indeed a traffic circle at Sprouse’s Corner. Let’s think about when power came to Buckingham (after World War II) and when a traffic light would have been put in place…. It is nice to see my family’s “Davidson Orchard” included on the map (on Rt. 15). I understand that….”back in the day”….my family owned over 5,000 acres there. I recently learned that during World War II, some German prisoners of war were brought in to help with the work on the orchard. Bill, Thanks for your comment, as always. I just learned that WW II POWs were housed at the old CCC camp in Albemarle. I’m beginning to feel a story here . . . In future posts, we’ll continue to explore the Caryswood Centennial map. Buckingham Houses: Caryswood | slate river ramblings . . . .